My name is Julie, and I recently joined the SeeClickFix team as the newest employee and first Account Executive. Three words describe the individuals who work at SeeClickFix: diverse, devoted and talented. Together, we are making big impacts in communities around the world. I’m pumped to be here! Hailing from the incredible city of Buffalo, NY, I’ve become a transplant in an equally amazing and welcoming city: New Haven. I felt a deep connection to New Haven within the first hour of my arrival – several of my neighbors stopped by to introduce themselves and lend a hand as I unloaded boxes from my car and began a new journey. My experience is not particular to New Haven; each state, city, town, neighborhood and block has unique characteristics that unite citizens. We also all have the opportunity to strengthen the areas we inhabit, and SeeClickFix makes it easy to turn that opportunity into action. At SeeClickFix, I work with our government and city partners, helping them to more effectively use our platform to better their communities. My mission is to help create an arena in which citizens desire to be active participators in their local governments and use their voices (or computers, iPhones or androids) to shape their surroundings. My mission is for governments to truly meet the needs of their citizens through the power of technology. SeeClickFix really is the perfect solution. Previous to SeeClickFix, I worked in admissions with the University of Dayton as the Northeast regional representative, strengthening current and developing new relationships with schools and students. I’m a proud and active supporter of local agriculture, and have worked with Blue Rock Station in Philo, OH; Saugatuck Craft Butchery in Westport, CT; and Massaro Community Farm in Woodbridge, CT. In addition to potholes, I believe there is a direct pathway between local food and citizen engagement. If you are one of our government clients, and you need anything at all, send an e-mail my way. If you are not yet a member, join our LinkedIn Group for government clients. I’ve enjoyed speaking with many of you, and I can’t wait to meet the rest! Together, we can strengthen your community’s capacity to see, click, fix. 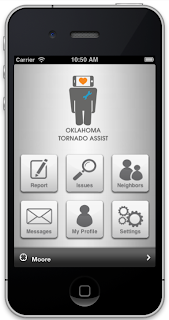 The folks in Moore, OK are recovering from a devastating tornado. Our thoughts and prayers are with them. For folks on the ground the SCF smart phone applications have been turned to storm mode at the request of City officials who are looking for ways to document damage and triage clean-up efforts. We'd also like to encourage neighbors everywhere to show some love for Oklahomans and text REDCROSS to 90999, to donate $10 to American Red Cross Disaster Relief, which provides food, shelter and emotional support to those affected by disasters like these. Over the last few weeks we have been slowly rolling out SeeClickFix Answers to a select group of cities mostly in the US. We're not entirely sure what will come of the tool but its existence is grounded in some pretty solid demand. 70% of the calls to municipal constituent service centers in the US are questions. Phone calls to Cities are expensive to the City and timely to the resident. Understanding how to get a marriage license, a copy of your birth certificate or whether or not you can keep a rooster in your yard should be easily searchable from your cell phone. We have not done a feature announcement to users in the locations we have turned, but it is available in 67 cities. So far there have been 52 answers to 85 questions. About 1/3 of the "answerers" work in City Hall and the rest are helpful neighbors willing to share their city knowledge. If you think its important that your neighbor knows where they can recycle electronics or get a child car seat inspected then we'd love your help to ramp up adoption over the next few weeks and shape the direction of SeeClickFix Answers. Maybe we can start to build a living municipal knowledge base for the world together. Email ben@seeclickfix.com if you're interested in helping out. According to the early data in towns with Answers turned on: about 30% of towns provide child car seat inspections. Most towns do not provide leaf bags for residents. Electronics recycling is commonly done by private entities. And yes you can keep roosters in Chicago. They just have to be very quiet roosters, or as some might call them...chickens. Friday Funtime: the Top 5 Issues This Week from Around SeeClickFix. 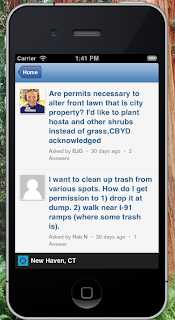 Spend a few seconds to check out these awesome issues from your SeeClickFix neighbors. Because it's Friday--who's working now anyway? 500,000th issue reported. We can't thank you enough, and if you want to spread the word even further we'll be your best friend. Last week, Burlington, Vermont held their 42nd annual "Greenup", where volunteers and the city get together for some city cleaning--with great results. The boys in orange for the City of Oakland got some great thanks for a job very-well done on this crazy pothole. From South Carolina to Minnesota, sinkholes are getting patched ("beautifully," according to one citizen). Have you reported a sinkhole near you? They say you never forget how to ride a bike. Now that this bike path has been completely repaved, it's time to go test that theory. SeeClickFix Reaches 500,000 Issues Reported! We've been a busy bunch lately, but we couldn't let this fall by the wayside. Last week a citizen in Richmond,VA clocked in the 500,000th issue reported through SeeClickFix. That is a seriously big number, and we want to thank every single one of you for being a part of helping us hit over half a million issues. Our very own developer, Tim, hails the 500,00th issue. We'd love for you to keep on reporting so we can get to 1 million even faster--and in the meantime, let us know in the comments what your favorite issue has been so far! A very cool find this morning is this short video from Dunwoody, Georgia about their public works department. With quick, concise info on who they are, what they do, and how to get in touch (including a great SeeClickFix mention), this is a great case of showing citizens why it's important to be involved. People don't think of public works as first-responders like police and fire, because they respond to life threatening issues, but we are also first-responders and are out there on the front lines with the other guys. Has your city improved communication between residents and public works? Or if you work for a city, how have you reached out to your citizens? City of Albany & SeeClickFix: Working Together "4 U"
Albany, NY (May 7, 2013) – Mayor Jennings today unveiled an updated City website, redesigned by L&P Media, which will prominently feature the region’s first municipal service tracker application – a new program that will allow residents to report a variety of quality-of-life issues and request city services through an online and mobile interface. The program, called “AlbanyWorks4U” is powered by SeeClickFix, the place-based reporting platform that allows residents to document neighborhood concerns and communicate directly with city departments. "The AlbanyWorks4U app and our partnership with the City of Albany will empower both residents and city employees to easily report and resolve public-space concerns," said Ben Berkowitz, CEO and Co-Founder of SeeClickFix. "We're proud to have partnered with a city who shares our company's commitment to improving communities and encouraging dialogue between local government and citizens." The application uses GPS to recognize location, while also allowing users to fill in an address manually, and provides a menu of common concerns from which to select. The app allows you to upload pictures to accompany your report, giving city workers the most detailed information possible to address each case. The app can be used for a variety of issues, including graffiti, street maintenance, street light issues, damaged trees, parking meters, and trash collection, among others. Residents can track the status of reports submitted and see what other issues are being reported in their area. They’re also able to follow an issue from the time it is reported until it is resolved, enabling residents to track of all types of service requests, not just the ones they report. 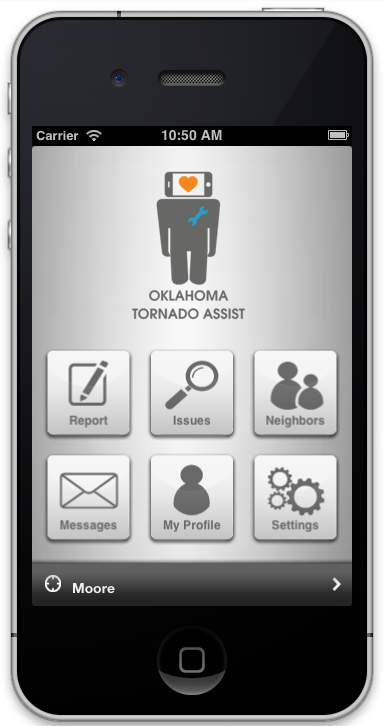 Citizens can even create their own “watch areas” to receive notifications about all issues reported in specific neighborhoods. In addition to this new website and exciting new service tracker application, Mayor Jennings also announced the city’s new CIO, Mark Dorry. As the CIO, Mark will advise the Mayor, City Council, and departments regarding technical issues and opportunities to provide higher quality, more timely, and more cost effective governmental services.